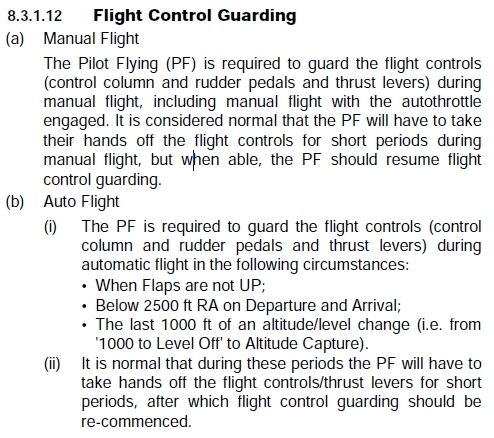 Recently I conducted some research into the concept of the requirement for the Pilot Flying (PF) to guard the flight controls when the autopilot is engaged during critical phases of flight such as takeoff or landing. So many of the habits and procedures we use as professional aviators are instilled in us by previous instructors, previous airlines, previous experiences – it’s only when we choose (or are forced) to investigate them that we realise things are not as clear cut as they seem. For me personally, I can’t imagine a flight deck where the PF doesn’t have hands and feet on the flight controls and thrust levers during approach to land, or the missed approach. This was instilled in me by my first airline (Cathay Pacific) and re-enforced in my second (Emirates). At the latter these were enshrined in the documentation and mandated during training and checking. It’s second nature for me and I’m most uncomfortable when I don’t see it being done in the aircraft or the simulator. 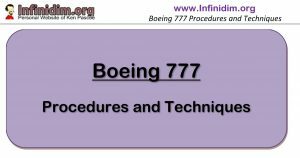 We fly the 777 and Boeing have gone to a lot of trouble to give us flight controls and thrust levers that provide tactile, visceral feedback of the aircraft’s control/thrust movements to the pilot – feedback that’s lost if the controls are not in the hands of the PF. felt were appropriate procedures for the 777. While the manufacturer’s SOPs are a great start to an airline, they’re pretty thin and assume a significant amount of operational experience, and leave a lot of gaps. They don’t address this particular issue at all. Hence the need to expand on and document further the way the airline’s check/training staff want to see the aircraft flown. So I reviewed the procedures of the other major 777 operators for whom I have documentation and contacts. Singapore, British Airways, Air New Zealand, Cathay Pacific, Etihad, to name a few. As it turns out there is a range of responses from nothing published at all, to very clearly documented windows of critical flight regimes where the controls must be guarded by the PF when the Autopilot/Auto Throttle is engaged. What is interesting is that when I contact the pilots working for those companies without guidance (or rules) on this issue – they’re pretty much in agreement that flight control guarding is trained, is checked and is actioned on the line. It would seem we’re all pretty much doing the same thing (the right thing?) whether the rules are there or not. So do we need these rules, published in our manuals? Or is it ok to leave it to the Check/Training staff to instill and enforce, and the line crews to understand and implement as they see fit? As an instructor or checker do you require the documentation to support your criticisms of line crews in areas that may not be of shared understanding? P.S> Would any Fly-by-wire, joystick equipped, non-moving thrust lever Airbus pilots like to comment here? What do you do?